Whey Protein free from pesticide, hormones and antibiotics. 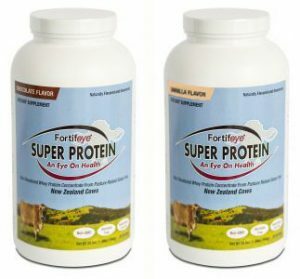 Fortifeye Super Protein is a non denatured whey protein concentrate from grass fed New Zealand Pasture raised A2 cows. Available in Chocolate and Vanilla! Fortifeye “Naked” Super Protein is Non Denatured whey protein from Grass fed New Zealand cows. This is the same great protein that Fortifeye has been using in their chocolate and vanilla proteins just Naked! This simply means it is pure protein and nothing else. There is no stevia, no flavoring, no guar gum and no lecithin just pure protein. This is great to add to pancakes , waffles or smoothies to gain more super high quality protein. Perfect for the Purists that want the most natural plain protein available. Dr Michael Lange discusses the importance of maintaining Glutathione levels for good eye and overall health.